“If the only tool you have is a hammer, everything starts to look like a nail”… paraphrased from Dr. Abraham Maslow (“Psychology of Science,” 1966). This famous axiom is also referred to as the law of the instrument. To explain further: once we learn a new skill or how to use a new tool, we begin to see new opportunities for its use everywhere we look, but at the same time we also often forget about all the other instruments in the toolbox. Suction specific speed (NSS) can be thought of as one index or tool in a mix of several tools regarding impeller design. NSS is a dimensionless parameter that describes the relationship between the speed, the flow rate and the net positive suction head required (NPSHr) of the rotating impeller. NSS is a tool, and it is not really a “speed” or “speed limit” at all. The concept of NSS was developed in the late 1930s by Igor Karassik and two associates. By the late 1970s and early 1980s, NSS had become a commonly used tool, ostensibly for predicting hydrodynamic instability in pump operations. Many people incorrectly view NSS as an absolute “speed limit” posted by the “pump police” in the range of 11,000 (no units). However, to paraphrase the respected comments of professional engineer Jerry Hallam, it may be more correct to think of NSS simply as the dashed centerline painted on a two-lane highway … “one can cross the line if proper attention is paid to details.” That is, you need to check for oncoming traffic before you go left of center to pass. Over the last few years, I have witnessed a marked increase in the usage of NSS indices in request for quotation data sheets and pump engineering specifications crossing my desk. More often, the entity has little idea what NSS really means or the significance of the number. When I probe for how the end user or their engineer will use and evaluate the NSS data, I typically receive no answer and/or what I perceive as a misunderstanding. The intent of my query to the requesting party is to determine their assigned priority and weight of the NSS number in the overall pump evaluation process, especially when compared to other parameters such as efficiency, NPSH margin and proximity to best efficiency point (BEP). Note: Please realize there are plenty of people in the industry who fully understand the NSS concept and possess valid reasons for asking the question. This article is simply a refresher for those people. Let us revisit the NSS concept. It is not my intent to make this month’s article a primer on NSS, but perhaps to shed new light on a subject that in my experience is commonly misunderstood. NSS is not to be confused with its older brother and more common concept of specific speed (NS). NS is an indicator of the impeller geometry and discharge characteristics, while NSS is an indicator of impeller inlet geometry and suction characteristics. NSS is, in essence, a function proportional to the speed, pump flow rate and the NPSHr. Visualize NSS as a mathematical expression for the geometric dimensions, spatial arrangement and vane angles at the eye of the impeller. Used properly, NSS can be a reliable harbinger, exploring the possibility of potential pump performance issues. 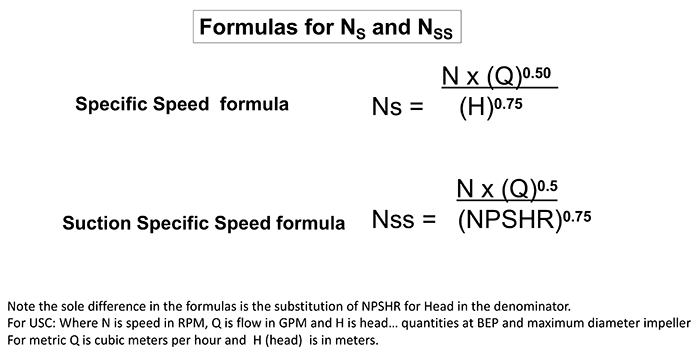 The formulas for the calculation of NS and NSS are shown in Image 1. The only real difference is that NPSHr is substituted for head (H) in the denominator. If you are not familiar with fractional exponents, there are several NSS calculators on the internet that will do the work for you. Actually, the pump manufacturer should be able to advise the NSS for all of the impellers they provide. However, when calculating NSS on your own, look at the manufacturer’s published performance curve for the pump; NSS is based on the flow rate for the maximum diameter impeller at the BEP and the corresponding NPSHr for that same point. The NSS formula is for single suction pumps (impeller with one eye). Consequently, if the pump is a double suction design (two eyes) like many horizontal split case pumps, then the BEP flow rate for the calculation is simply split in half. For multistage pumps, it is the first stage flow and NPSHr.